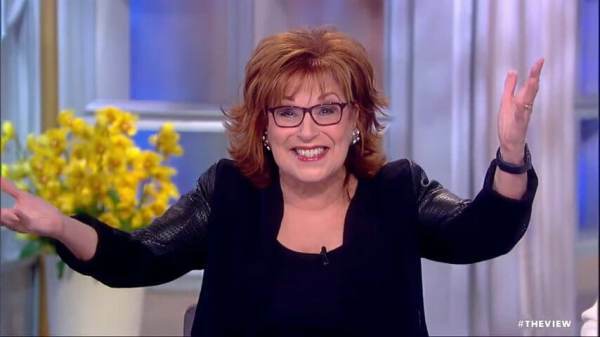 Friday morning on ABC’s The View, co-host Joy Behar was handed a large blue card during the live broadcast of the show by a stagehand who told her, “Breaking news.” Behar started reading the card, which relayed a (what turned out to be false) report from ABC’s Brian Ross that Gen. Michael Flynn had pled guilty and was prepared to testify that President Donald Trump directed him during the presidential campaign to contact the Russians. Behar grew ecstatic as she read the report, tossing the blue card in the air in celebration. The studio audience and most of other View co-hosts cheered along with Behar. The View panel discussed for the next seven minutes the fake news that ‘collusion’ between Trump and the Russians during the campaign was finally proven. Joy Behar celebrates fake news from ABC News that collusion between the Trump campaign and Russia was proven. Screen image. Buzzfeed posted a shorter version with just the reading and reaction by Behar, the View co-hosts and the audience. The View tweeted the fake ‘breaking news’ segment several times throughout the day and retweeted it Friday night without issuing a much needed correction. The stock market tanked soon after the fake news report by ABC. 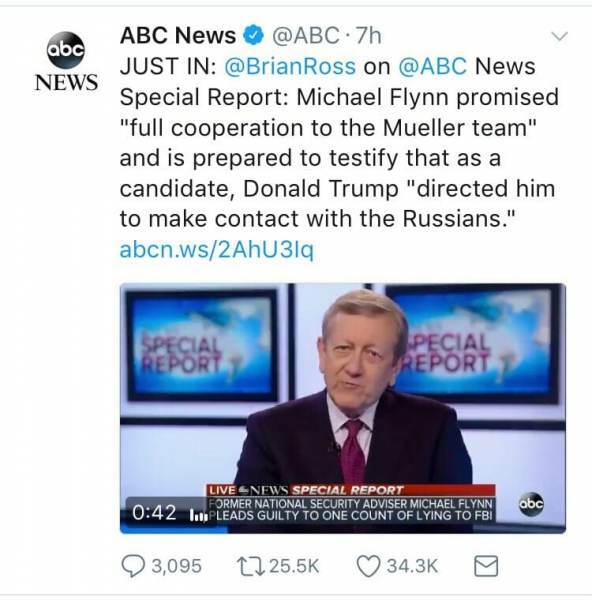 Screen image of ABC News tweet of Brian Ross’ fake report before it was taken down, via Nick Short. Note that the fake news report had been up for at least seven hours. This is yet another example of when the media says, “this is an apple,” conservatives look for a banana peel. UPDATE: Entertainment Weekly reported on Behar’s reaction to the fake Flynn news and has not posted a correction. People picked up the EW report and also has not corrected. Joy Behar just received what she feels is the best news since the 2016 election. As the co-host started a segment of The View Friday, a producer rushed over to give her some breaking news to read: “ABC News’ Bryan Ross is reporting Michael Flynn promised full cooperation to the Mueller team and is prepared to testify that as a candidate Donald Trump directed him to make contact with the Russians! Yes!” she exclaimed, tossing her cue card up in celebration. Say hello to your new favorite GIF. On Friday, a producer for “The View” interrupted co-host Joy Behar on air to deliver some breaking news. Behar read from a notecard the producer handed to her, sharing the news that President Donald Trump’s former security adviser Michael Flynn pleaded guilty to lying to the FBI. UPDATE: The View deleted the tweets promoting the fake news segment Saturday morning and retweeted the ABC News correction. A copy of the now deleted segment was posted to YouTube.